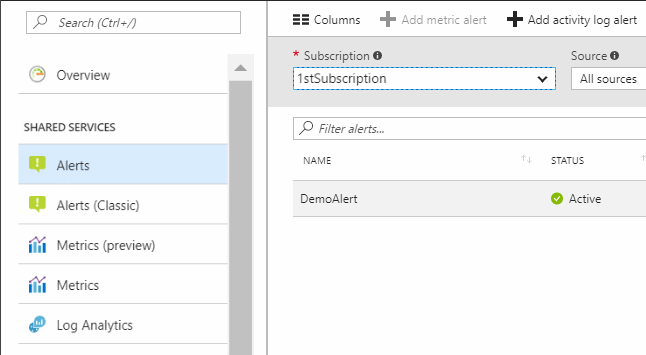 Service health notifications are published by Azure, and contain information about the resources under your subscription. These notifications are a sub-class of activity log events, and can also be found in the activity log. Service health notifications can be informational or actionable, depending on the class. Action required: Azure might notice something unusual happen on your account, and work with you to remedy this. Azure sends you a notification, either detailing the actions you need to take or how to contact Azure engineering or support. Assisted recovery: An event has occurred and engineers have confirmed that you are still experiencing impact. Azure engineering needs to work with you directly to restore your services to full health. Incident: An event that impacts service is currently affecting one or more of the resources in your subscription. Maintenance: A planned maintenance activity that might impact one or more of the resources under your subscription. Information: Potential optimizations that might help improve your resource use. Security: Urgent security-related information regarding your solutions that run on Azure. channels One of the following values: Admin or Operation. correlationId Usually a GUID in the string format. Events that belong to the same action usually share the same correlationId. eventDataId The unique identifier of an event. eventName The title of an event. resourceProviderName The name of the resource provider for the impacted resource. resourceType The type of resource of the impacted resource. subStatus Usually the HTTP status code of the corresponding REST call, but can also include other strings describing a substatus. For example: OK (HTTP Status Code: 200), Created (HTTP Status Code: 201), Accepted (HTTP Status Code: 202), No Content (HTTP Status Code: 204), Bad Request (HTTP Status Code: 400), Not Found (HTTP Status Code: 404), Conflict (HTTP Status Code: 409), Internal Server Error (HTTP Status Code: 500), Service Unavailable (HTTP Status Code: 503), and Gateway Timeout (HTTP Status Code: 504). eventTimestamp Timestamp when the event was generated by the Azure service processing the request corresponding to the event. submissionTimestamp Timestamp when the event became available for querying. subscriptionId The Azure subscription in which this event was logged. status String describing the status of the operation. Some common values are: Started, In Progress, Succeeded, Failed, Active, and Resolved. operationName The name of the operation. category This property is always ServiceHealth. resourceId The Resource ID of the impacted resource. Properties.title The localized title for this communication. English is the default. Properties.communication The localized details of the communication with HTML markup. English is the default. Properties.incidentType One of the following values: ActionRequired, Informational, Incident, Maintenance, or Security. Properties.trackingId The incident with which this event is associated. Use this to correlate the events related to an incident. Properties.impactedServices An escaped JSON blob that describes the services and regions impacted by the incident. The property includes a list of services, each of which has a ServiceName, and a list of impacted regions, each of which has a RegionName. Properties.defaultLanguageTitle The communication in English. Properties.defaultLanguageContent The communication in English as either HTML markup or plain text. Properties.stage The possible values for Incident, and Security are Active, Resolved or RCA. For ActionRequired or Informational the only value is Active. For Maintenance they are: Active, Planned, InProgress, Canceled, Rescheduled, Resolved, or Complete. Properties.communicationId The communication with which this event is associated. Error - Widespread issues accessing multiple services across multiple regions are impacting a broad set of customers. Warning - Issues accessing specific services and/or specific regions are impacting a subset of customers. Informational - Issues impacting management operations and/or latency, not impacting service availability. In the Azure portal, select Monitor. Azure Monitor brings together all your monitoring settings and data into one consolidated view. It first opens to the Activity log section. Select +Add activity log alert, and set up an alert to ensure you are notified for future service notifications. For more information, see Create activity log alerts on service notifications. Receive alert notifications whenever a service health notification is posted. Learn more about activity log alerts.